Fifty years after the Stonewall Riots, our movement has come further than we ever could have known. Following the election of the nation’s first openly gay governor, pro-equality majorities in both chambers, and the 2nd largest delegation of LGBT elected officials in the country, we are closer than ever to passing our two priority bills that will change the lives of LGBTQ Coloradans — it’s time to take a moment to celebrate. Join us on Saturday, May 11th for a legislative brunch celebration as we commemorate this movement, this community, and this great state that we call home. 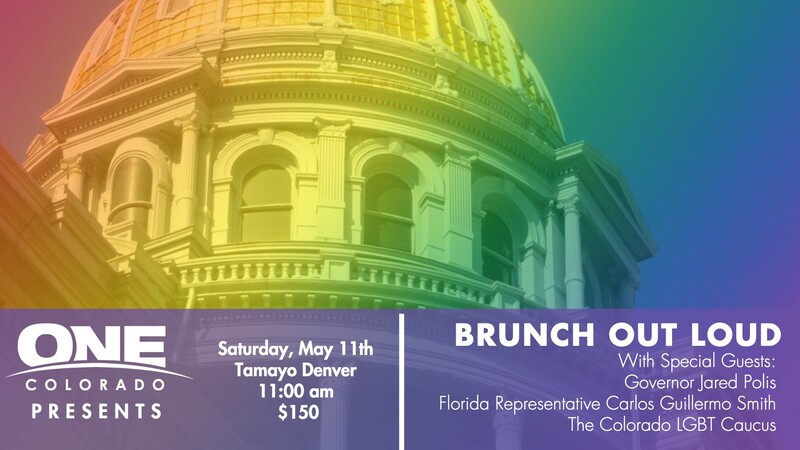 When: Saturday, May 11th, 2019 at 11:00 a.m.
Who: The Colorado LGBT Caucus, Special Guests, and YOU! Featuring bottomless mimosas, delicious brunch treats, and some incredible special guests – you won’t want to miss out! Interested in sponsorship opportunities? Please contact Garrett Royer at garrettr@one-colorado.org or visit our sponsorship page right here for more information!